Watch Crayon Shin-chan: Burst Serving! Kung Fu Boys ~Ramen Rebellion~ online & overview. Where to watch Crayon Shin-chan: Burst Serving! Kung Fu Boys ~Ramen Rebellion~. All available online streams and DVD purchase information. Movies synopsis, runtime, release dates and more. 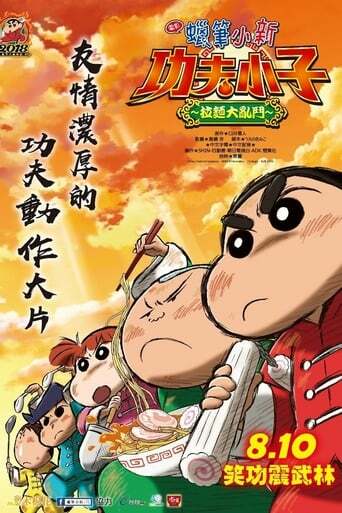 Do you want to watch movies FREE like Crayon Shin-chan: Burst Serving! Kung Fu Boys ~Ramen Rebellion~ (2018)?. Why not sign up to one of the streaming services below!. Crayon Shin-chan: Burst Serving! Kung Fu Boys ~Ramen Rebellion~ maybe available to watch online or stream from the links and rental services below. Please note we only list LEGAL streams and rentals for this movie and a rent or purchase fee may apply. Buy Crayon Shin-chan: Burst Serving! Kung Fu Boys ~Ramen Rebellion~ on DVD or BluRay? Are you looking to by Crayon Shin-chan: Burst Serving! Kung Fu Boys ~Ramen Rebellion~ on DVD, BluRay or 3D? If it's available to buy you will find the best prices and most trusted market places to buy from below. Crayon Shin-chan: Burst Serving! Kung Fu Boys ~Ramen Rebellion~ was released April 2018 and is directed by Wataru Takahashi. Akiko Yajima,Miki NarahashiandSatomi Kōrogi are some of the actors that star in the Crayon Shin-chan: Burst Serving! Kung Fu Boys ~Ramen Rebellion~ movie, for a full list please see the cast tab in the movie menu above. Crayon Shin-chan: Burst Serving! Kung Fu Boys ~Ramen Rebellion~ is a Comedy movie and the approximate length of the movie is 105 minutes.